A simple system that uses duct made of highly reflective material to bring in natural light into the space, enabling a considerable energy natural light into the space, enabling a considerable energy consumption saving. There are no mechanical parts involved and no power is required. Mirror ducts capture zenith daylight (which is brighter than lateral daylight) through external collectors. Light is channeled into horizontal reflective ducts within the false ceiling which then exits through the ceiling apertures above a user. Such light is usually glare-free. Light shelves are highly reflective surfaces that reflect daylight deep into space. 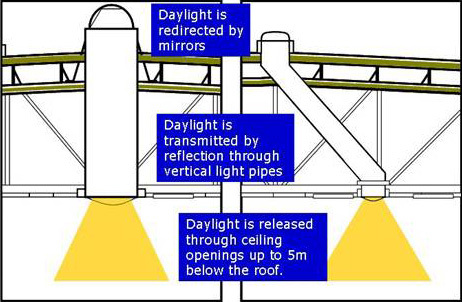 This can help to reduce the use of artificial lighting at daytime. The efficiency of the light shelves in ZEB is enhanced using ceiling material that has a highly reflective coating on the surface. Light shelves also provide shade against direct sunlight. The system is essentially a pipe that sticks out of a building's roof and reflects sunlight directly into an interior room. It is more energy efficient than skylight since less energy escapes from the interior due to less surface area. There are 2 types of light pipes. One type of light pipe is equipped with rotating mirror which is located in open area while the other type does not have any rotating mirror. Sunshade devices minimize direct sunshine, which reduces solar gain on the façade, without compromising daylight and natural ventilation. In addition to providing shade, the sunshades surfaces exposed to direct sunlight are each installed with a piece of thin film amorphous photovoltaic panel. 1m2 of this panel can generate about one no. of 45-Watts light bulb. Hence, the total PV installed on the shading devices is able to power 24 nos. of such light bulbs. Electrochromic glass is glazing that changes its opacity depending on the amount of sunlight being received. This is being tested for its light and heat control. 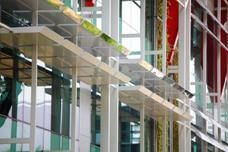 Photovoltaic glass has dual function of providing shading and generating power at the same time. This is being tested for its efficiency, impact on view, shading, heat absorption and re-radiation. Double Glazed Unit (DGU) with internal operable glass is being studied for it impact on view, shading and heat absorption. These consist of blinds between the glasses which can be turned up during strong sunlight. 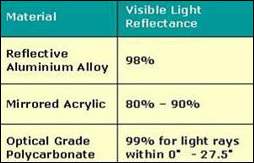 Clear DGU glass is used as a reference for comparison. The air between the double sheets of windows is thoroughly dried and the space is sealed air-tight, providing superior insulating properties and eliminating possible condensation. Double glazing is used in all air conditioned areas. Single glazing is used in the classrooms and school hall. The core concept of the solar assisted stack ventilation system revolves around the use of heat removed from solar panels to induce ventilation in the school hall and classrooms (buoyancy effect). Heat is built up below the solar panels when it is working. A 300mm gap is allowed between the solar panels and the metal roof to allow ventilation which is essential to ensure efficiency of the solar panels. 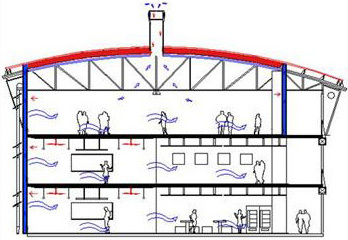 Heat in the gap is also a good source to produce buoyancy effect which is the principle for natural ventilation in the school hall and classrooms. Since the indoor space of the school hall and classrooms is linked with the gap by channels, when heat is removed from the gap, air flows into the air channel due to the negative pressure in the solar panel roof gap. To keep the pressure balance in the rooms, outdoor fresh air will be induced through the windows. Dark color metal ducts or solar panel can be used to construct air channel to further enhance heat removal (stack effect). 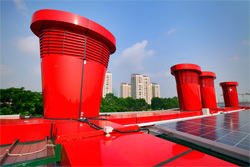 Several chimneys can be placed on the roof and extraction fan is installed in each chimney to provide the extraction when stack effect is not functioning.